This is a question I get asked almost anytime I bring up veneers as a potential treatment option for my patients. 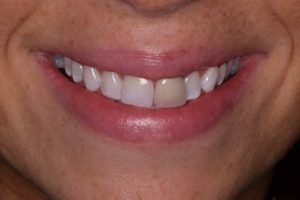 As “cosmetic dentistry” has become more and more popular, more patients turn to veneers for a variety of reasons, including to correct spacing, discoloration, or to improve their overall smile. Unfortunately, all too often, those veneers don’t blend well with the patient’s other teeth, or they are made to be too white, too opaque, or unnaturally sized so that they stand out like a sore thumb. What I tell my patients who ask me this question is that the best veneers we can do are the ones no one knows are there. Here are three steps we take at Kidder Dental in order to make sure veneers look beautiful and natural. One of the most important pieces of equipment I have at my disposal is my digital camera. Anytime we start discussing improving the esthetics of a patient’s smile I immediately take out my camera and start taking photographs. We take several images on every cosmetic case we do. This allows us to adequately capture a current visual of the patient’s smile and improve the communication between us and our patient. It also allows us to communicate better with our laboratory technician, who will be creating the veneers. Without photographs, the technician has to guess what the remaining teeth look like. There are subtle variations in color and texture that cannot be appreciated without high quality photographs. 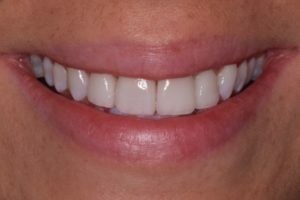 Simply writing a shade on a piece of paper results in veneers that don’t blend well with the patient’s existing smile. Without a doubt, the most important step in making natural-looking veneers is using a high quality lab. The laboratory technician is the person who sculpts the veneers out of porcelain. It is truly an art, and something that, like many things in life, you get what you pay for. There are less expensive options available to make veneers, but we refuse to make any compromises that might sacrifice the quality of our veneers. In creating a beautiful smile with veneers it is extremely important to know exactly what we want the final result to look like. In order to do that, we again utilize our lab technician. In most cases, we can utilize the initial models of the patient’s teeth to create a mock-up of what we want the final result to look like. In many cases, we can even try the mock-up in the patient’s mouth so they can truly see what the outcome of their treatment will be before we ever touch their natural teeth. We use the mock-up to create temporaries so that the patient can test-drive our plan and make sure his or her speech, chewing and jaw function are unaffected by the new smile. Veneers can be a fantastic way to correct esthetic problems with your teeth, in a way that no one will know what changes were made, only that suddenly your smile looks amazing. We would love to sit down with you and discuss how veneers might make your smile more beautiful. See the pictures below that illustrate how natural veneers look when we follow these three steps. This patient had three veneers and one crown redone, and as you can see, everything looks natural and this patient was very happy.